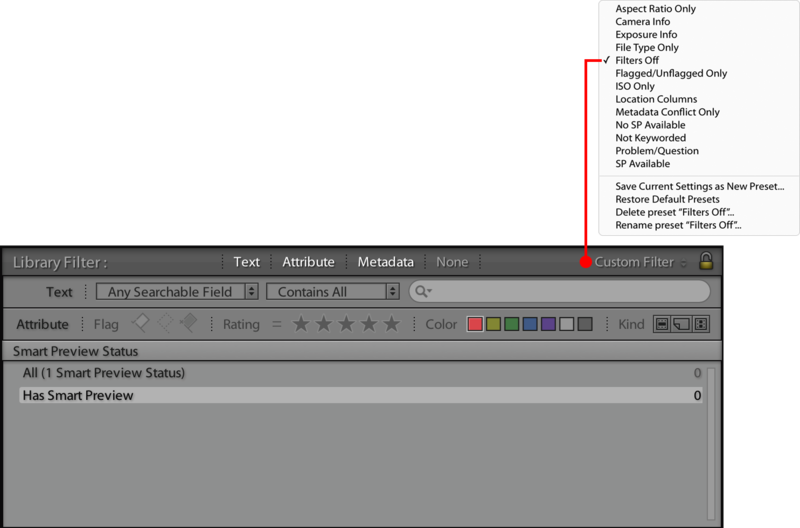 Screenshot 1: The filter presets are accessed by clicking on the currently selected preset located on the right end of the filter bar. The eighth step, while not as fun as organizing and editing your images, is a necessary step: Use filter presets and smart collections to help keep your catalog clean and organized. 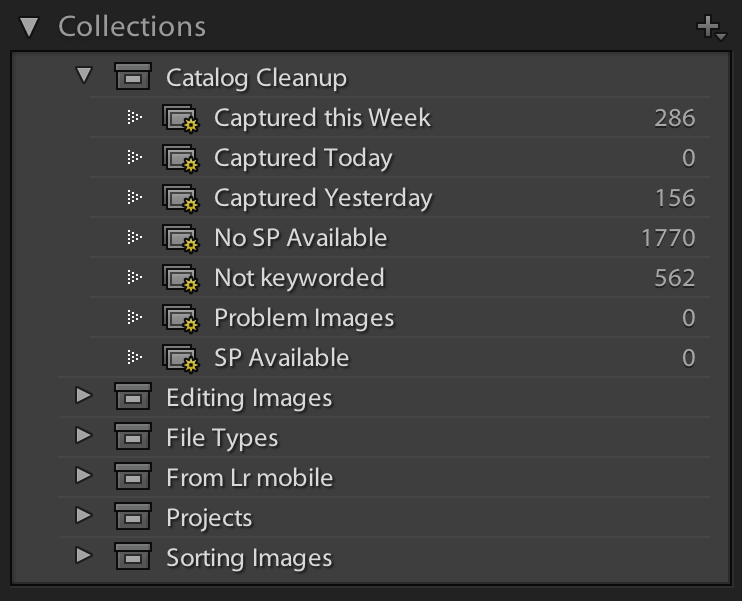 Screenshot 2: The Collection panel displaying a Collection Set titled “Catalog Cleanup” used for cleaning my catalog. As covered in previous posts, there are a significant number of steps in organizing your images in Lightroom and, as a result, it can be difficult to know whether you have completed every step in your workflow. However, Lightroom can help you determine what steps are left to do using filter presets (see Screenshot 1) and smart collections* (see Screenshot 2). Filter presets display images in the folder selected in the Folders panel that met the condition or conditions in the preset; smart collections will include any images in the catalog that meet the text condition or conditions of the smart collection. A filter preset’s or smart collection’s criteria can be simple, consisting of one text condition, or complex, consisting of many text conditions. For example, a preset or smart collection can display all the images in the folder or catalog, respectively, that has a specific color label, e.g., red label, assigned to it or has a specific color label and a specific keyword assigned to it. You don’t add images to a smart collection Lightroom add all the images that meet the criteria to the collection automatically; it will also remove any images that met the criteria but have been changed and no longer met the criteria. You can use filter presets and smart collections to help you maintain your Lightroom catalog. For example, a filter preset and smart collection that displays images that have no keywords assigned to them tells yow, respectively, what images in the currently selected folder have no keywords and what images in the catalog have not been assigned at least one keyword. To help you manage offline editing, I have two presets, one that displays the images with a smart preview and the other images that do not have a smart preview. This allows you to create smart previews for images that you want to edit offline and delete the smart previews that you no longer need. Screenshot 3: The preset menu actions with the Save Current Settings as New Preset… command. Screenshot 4: The New Preset window for naming a new preset. 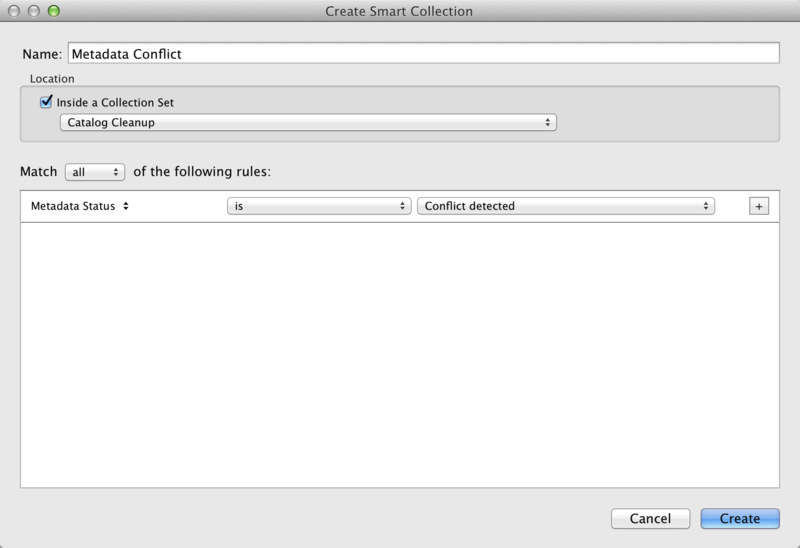 Screenshot 5: The Create Smart Collection window. Simple but frequently overlooked, filter presets and smart collections can help you to keep your catalog clean and up to date. By doing so, extraneous images, mistakes, and overlooked workflow steps can be corrected before they get in your way later, speeding up your workflow and allowing you to easily and quickly find your images. *As discussed in the last post, there are two types of collections, collections and smart collections, and one type that exists at all times, quick collection, in Lightroom. You can have as many collections and smart collections as desired but only one quick collection per catalog. Images are manually added to and removed from a collection (so I sometime refer to these as manual collections). A smart collection is a collection that is populated according to a rule or set of rules and any images that meet the criteria set by the rules existing at the time the smart collection is created or exists in the future are automatically made a part of the collection. Images are added to the quick collection by dragging and dropping the image on the Quick Collection or using a shortcut. Editor’s Note: In early May, Brian started a series of ten posts each outlining one or more simple but small things you can do to speed up your Lightroom workflow. This is the eighth post in that series; the first post was about how to efficiently manipulate Lightroom’s interface to reduce clutter; the second about the improving your efficiency inside Lightroom by using context menus; the third about how to name folders; the fourth about how to name image files; the fifth about using keyboard shortcuts; the sixth about using keywords to quickly find images; and the seventh about using collections to organize your images. 06 Jul	This entry was written by School of Creative Photography and published on July 6, 2014 at 12:54 pm. It’s filed under Editing Images and tagged editing, lightroom, raw. Bookmark the permalink. Follow any comments here with the RSS feed for this post.